Then you should really like Riso alla Pitocca, Italian for traditional chicken and rice and from Lidia Matticchio Bastianich’s cookbook, Lidia’s Favorite Recipes. If you’re looking for foolproof Italian dishes, you’re might want to buy her book! I love this recipe because while it sounds simple, the combination of fresh ingredients create an irresistible and authentic Italian dish. Chopped onions, carrots and celery create bold and bright colors to this dish. 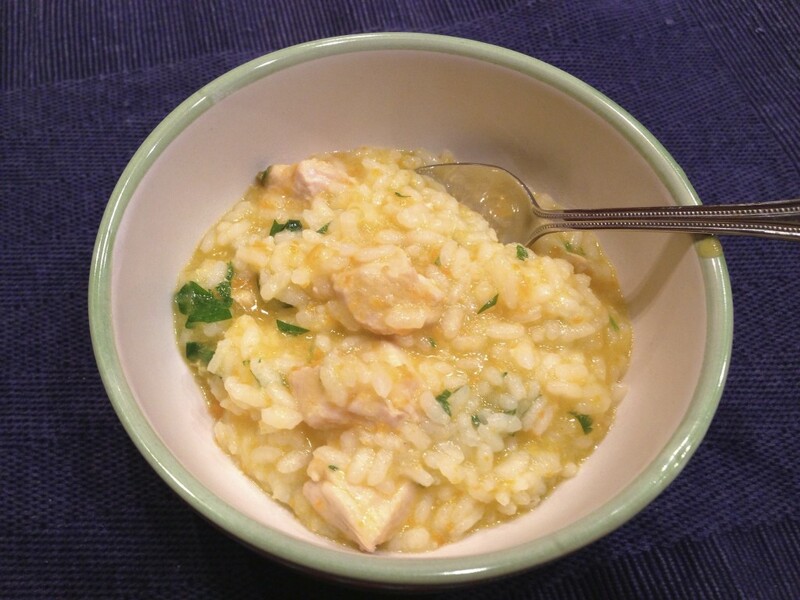 The chicken makes this dish savory, and the wine, chicken broth and cheeses create a unique complexity of flavors that cannot be beat. 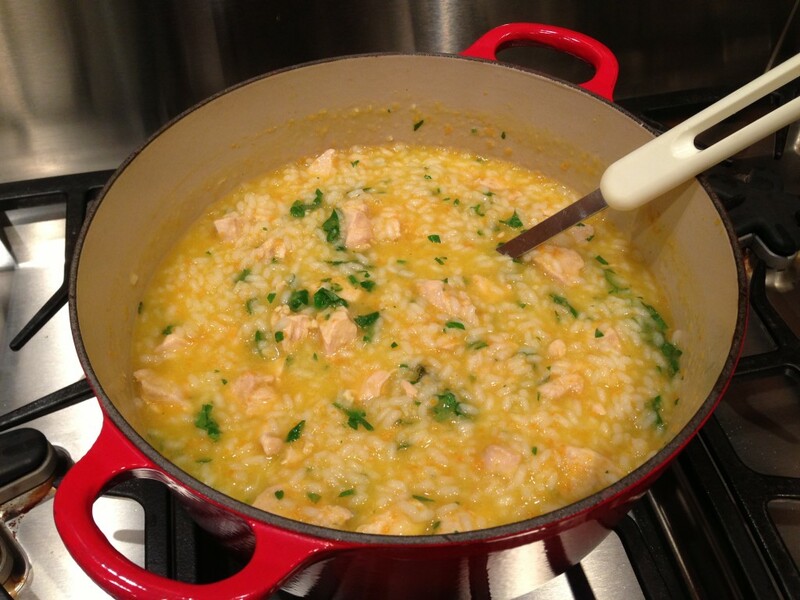 Once you get your pestata (crushed onion, carrot, celery and garlic) and chicken cooked, add the liquid ingredients and rice and bring to a boil. Then let is cook for 14 minutes and you’re pretty much done. All that’s left is to stir in the butter, parsley and my favorite ingredient… Parmigiano-Reggiano! Did I mention my parents’ cat likes this dish? 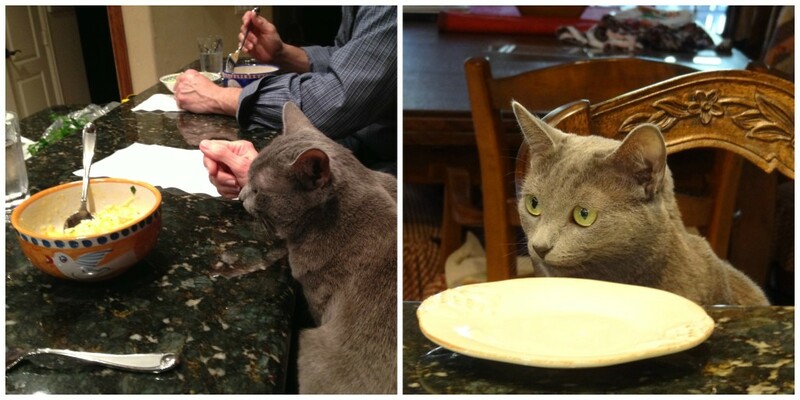 Their cat is kind of weird…. she actually likes people food! I’ve never seen a cat that acts as much like a dog as this one does. Its actually kind of cute and makes me love her even more. Trim any excess fat from the chicken thighs, and cut the thighs into 1-inch chunks. Use a food processor to mince the onion, carrot, celery, and garlic into a fine textured pestata (means "to crush" or "to grind" in Italian). Pour the olive oil into a saucepan and set over medium-high heat. Stir in the pestata, and season with 1 teaspoon of the salt. Cook for about 5 minutes, stirring frequently, until the pestata has dried. Toss in the chicken pieces and the bay leaf, and sprinkle with remaining salt. Tumble the chicken in the pan until browned and caramelized all over, about 4 minutes. Raise the heat, pour in the white wine, and cook, stirring and scraping up the browned bits in the pan, until the wine has almost completely evaporated. Pour in the hot stock, stirring, and add the rice. Bring to a boil over high heat, then cover and reduce the heat to keep the riso bubbling gently. Cook for about 14 minutes, or until both the rice and the chicken chunks are fully cooked and the consistency is creamy. Turn off the heat, drop in the butter pieces, and stir vigorously until thoroughly combined; then stir in the parsley and ½ cup of grated cheese. Spoon the riso into warm pasta bowls, and serve immediately, passing additional grated cheese at the table. 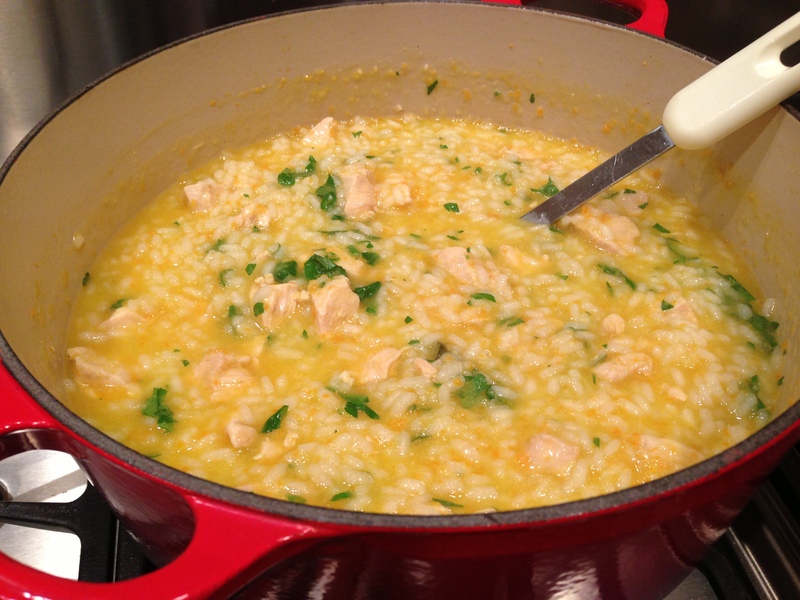 2 Responses to "Riso alla Pitocca (Traditional Chicken and Rice)"
Hi Lauren! I made this the other day for dinner. It was so delicious. Thanks for the recipe!